Celebrated Russian playwright, known for his expressionistic and oftentimes symbolist works Leonid Andreyev's lesser known short story, The Little Angel, was the inspiration for this evening's new Musical of the same name by Yorkshire-based company Actual Size. It tells the morbid and quite surreal story of a young man born into a poor and uncaring family, who is maltreated by them and everyone, except a kindly neighbouring family who pay for his schooling. His thoughts are of suicide and yet, as his mother turns to alcohol and husband beating, and his father slowly sits shivering with consumption, something compels him to accept an invitation to the neighbour's house at Christmastime. His father makes a strange request, to bring him back a small gift, something from the Christmas tree, and as he looks at the baubles hanging there, his eyes catch a perfectly carved and beautiful angel. He becomes transfixed and obsessed with this angel, and does eventually bring it home for his father. We learn that the lady of the house and his father were in love many years ago, and despite both marrying others the love still remains, and it was this angel that his father carved as a gift for her all those years ago. So when he brings it home and shows his father it naturally stirs memories, but it is as if this was meant to happen, a force we perhaps call Destiny, was guiding the young man to make these choices. He places the angel above the stove overnight and as they sleep the angel melts, and his father dies. This gives him a new lease of life and a chance to start again, and so with a lighter heart he leaves his mother to her drink and sets off out into the world determined to make good. It's a lovely story and has many interesting theatrical possibilities. In this version, a five-hander one hour long Chamber Musical, by Paul Dale Vickers (who also directed it), it took on a very dark and sinister tone with moody blue and atmospheric lighting and smoke reminiscent of a vampire-type tale. It became almost threatening and challenging. This was due also to the fact that the directing took a very Brechtian approach to the whole. The characters hardly ever looked at each other and never spoke directly to each other, but instead spent the majority of the time staring out into the audience to speak their parts and all the singing was done in this vein too. It became very predictable, samey, and sadly I found that because of this, incredibly difficult to relate to any of the characters. Further, the characterisations were only skin deep, and so once again a la Brecht. We were aware all the time that they were actors telling a story, and not the characters themselves. This was reinforced by the use of narrators joining in the action, and utilising clothes rails either side of the stage for the cast to change costume in full view of the audience. The minimalist composite set comprised of chairs and a metal grid structure back centre which could have been anything from a Jewish symbol to an instrument of torture. It was however used only as the Christmas tree. The Musical was written very much in the style of modern musicals, mostly through-sung with very little actual spoken word, and musically reminiscent of the quasi-pop rock style that seems to be very much the mode at the moment. Sadly the music was canned, obviously due to budget and performance venue size, but the 5 performers worked excellently with it. Our protagonist, Sashka (Alex Hall), the young man whose life is changed by the little angel, was a little vocally tired this evening as some of the higher notes were flat, but still managed to give a solid and believable performance. His father, and also a young girl with long blonde hair which seemed to come from nowhere, was writer / director Paul Dale Vickers, whilst his alcoholic and unfeeling mother was Sam Beswick. The play was narrated by two young ladies, whose singing and acting surprisingly impressed me more than that of the three protagonists this evening. They were Phoebe Lloyd and Caitlin Magee, who also played Maria, Sashka's patron and true love of his father. Her interpretation of this role, despite her being far too young to portray it, was excellently observed. This Musical as it stands at the moment is more of a concept than a finished product, but certainly has the potential to grow. 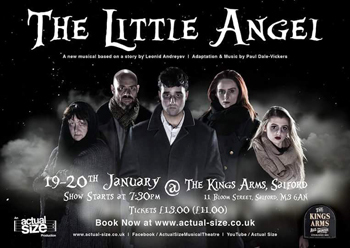 You can next catch this production at The Hen And Chickens in London in February.